The outsole of the Ultra Boost All Terrain delivered fantastic traction, commented one runner. Many users were impressed with the water-repelling feature of the shoe. A lot of people mentioned that it had a suitable fit. Several runners likened the experience of wearing the shoe to stepping on clouds because of the amount of comfort that it gave. One reviewer was happy with the way the Primeknit hugged the foot; it apparently resulted in a balance of softness and security that allowed for a problem-free run. Some users felt that the fabric of the sock collar was uncomfortable on the skin; others said it hurt their ankle after a few miles of running. This shoe was supposed to be an upgrade yet it did not feel a lot different from previous versions, according to a reviewer. A tester relayed that the upper did not provide adequate support, thus resulting in foot-wobbling and sliding. Many buyers mentioned that the tongue design was unappealing, affecting the overall look of the shoe. As an improved version of an already well-performing shoe, the Ultra Boost All Terrain is packed with new and unique features that aim live up to the name of the series. While many buyers did not regret getting the Ultra Boost All Terrain, there were a few who thought that this trail running shoe was not worth its high price tag. It's just a lot of extra money for ruggedization that you probably don't even need. For the long run, this might be a better pickup as it works ideally for various weather conditions. But for comfort on a general level, the cheaper Ultra Boost 3.0 model will work just as well for a daily user. I preferred running in the regular UltraBoost or the PureBoost DPR, both of which are lighter (especially the DPR), cheaper and aren’t going to fall apart at the first sign of rain, but the All Terrain is another solid addition to the Boost family. I can definitely see why they put it up to $240 because, in all honesty, this is by far the thickest and the most durable Primeknit I've ever seen them put on an Adidas sneaker. The Ultra Boost All Terrain has a unique construction that is unlike any other mid-cut shoe in the market. It is weightier compared to its predecessor because of some additional features. It is designed for runners with neutral pronation and is ideal to use for daily running. Primeknit wraps the foot in an adaptive and supportive manner. A thin film completes the upper to provide water-repelling capabilities, while a garter collar delivers added security and snugness. The boost™ cushioning in the midsole ensures a responsive and energized ride for the foot. It sits on a Continental™ rubber outsole that aims to deliver traction no matter the condition and the environment. The Adidas Ultra Boost All Terrain is specifically for men. It employs a standard running shoe length. Despite the seemingly thick form of the Primeknit material, getting the regular size still provides a suitable fit. Also, the toe box is wide enough to enable a comfortable toe splay. The available width is D – Medium. The Ultra Boost All Terrain uses Continental™ rubber. This type of outsole employs automotive tire technology as it targets an impressive grip on roads and trails. The technology also increases the shoe’s capacity to resist wear and tear. The gripping lugs are more pronounced than other All Terrain shoes on the Adidas roster. On top of the Continental™ outsole is the STRETCHWEB rubber, which features a pattern that flexes underfoot to provide an energized ride. It aims to lower the pressure from foot strike, thus decreasing the chances of discomfort. Featuring Adidas' signature boost™, the midsole provides a plush comfort while maintaining a springy ride. This technology works by absorbing the impact of the foot strike and releasing it during take-off, resulting in an energized push from the ground. There is also a removable sock liner that is replaceable with customized insoles to enable a more pleasant wearing experience. 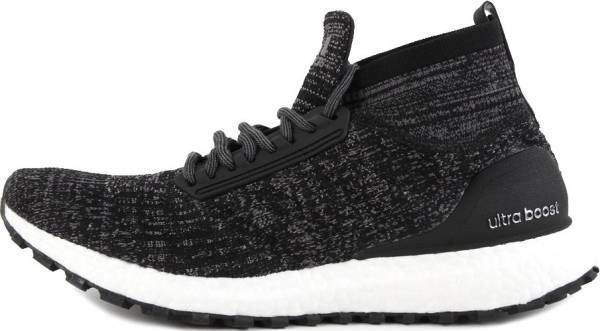 A full Primeknit upper of this Ultra Boost running shoe offers an adaptive coverage and an elastic feel. Adidas claims a one-of-a-kind knitting process, resulting in no two uppers in any shoe being alike. While it is thicker than the older versions of Ultra Boost, it is also softer as it aims to provide both comfort and protection. The Primeknit is wrapped by an ultra-thin film layer that has a water-repellant feature. This add-on allows the foot to stay in momentum without being distracted by wet conditions. The shoe does not have an external cage, a typical feature in other Adidas Ultra Boosts. However, it possesses an internal midfoot skeleton to provide the same level of support. The unique mid-cut sock collar that’s designed to provide warmth during winter conditions. It also prevents rocks and dirt from getting into the shoe. It also comes with an extended pull tab with 3M strips to provide visibility when running in the dark. The signature FITCOUNTER molded heel counter is present in this running shoe, though it is featured in a new matte texture. It aims to keep the foot snug and secure while remaining soft to prevent too much pressure on some areas like the Achilles.